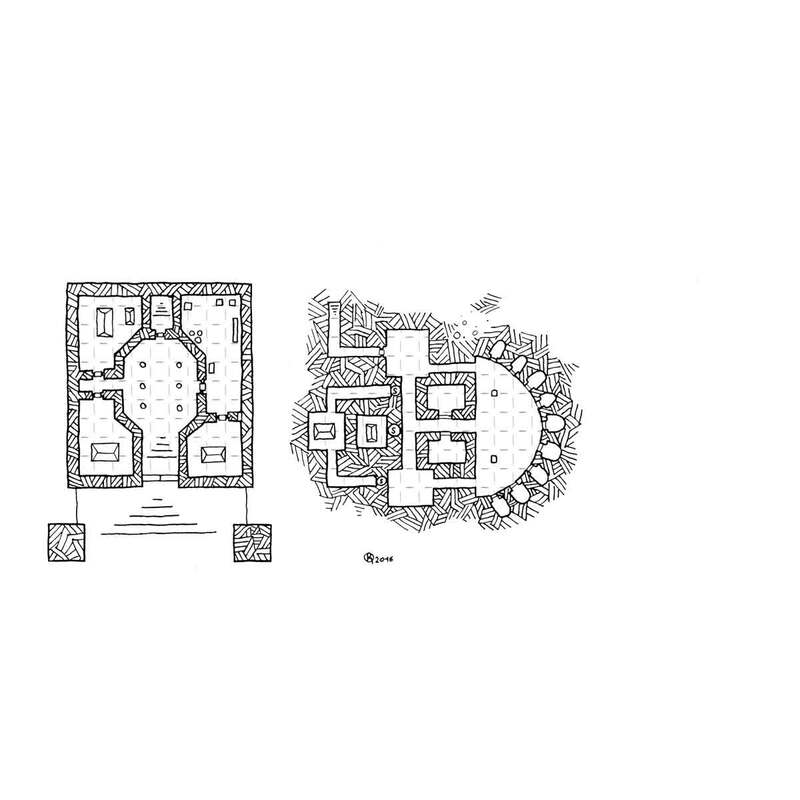 Ilburg’s outpost is the map I made for the winner (David) of the contest on the facebook page. I exceeded a bit the original size planned but David generously lets me publish this map under the usual conditions. feel free to leave him a small thank you on the blog or on facebook. The Ilburg’s outpost belongs to the most holy order of the sons of Illius, a fundamentalist Trinitarian sect divided into monastic chapters. Located on a pilgrimage route along the Ebony coast, the fort’s role is to serve as a relay to the pilgrims passing through, to extend the influence of order in this hostile region and above all to monitor the possible invasions Nordic from beyond the dark sea. Encircled by a thick outer wall, the outpost also has natural defenses: the ebony coast to the north, a creek to the south and east, allowing the fort to be supplied with fresh water and Relief of the coast. 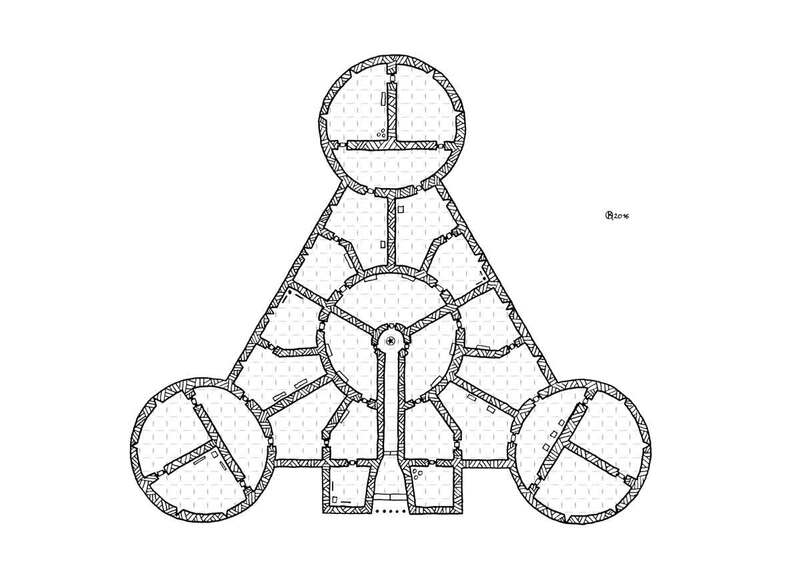 A church, in the center, because worship is at the center of the preoccupations of the sons of Illius. A H shaped military barracks where are trained the holy soldiers of the order also serving as dormitory. 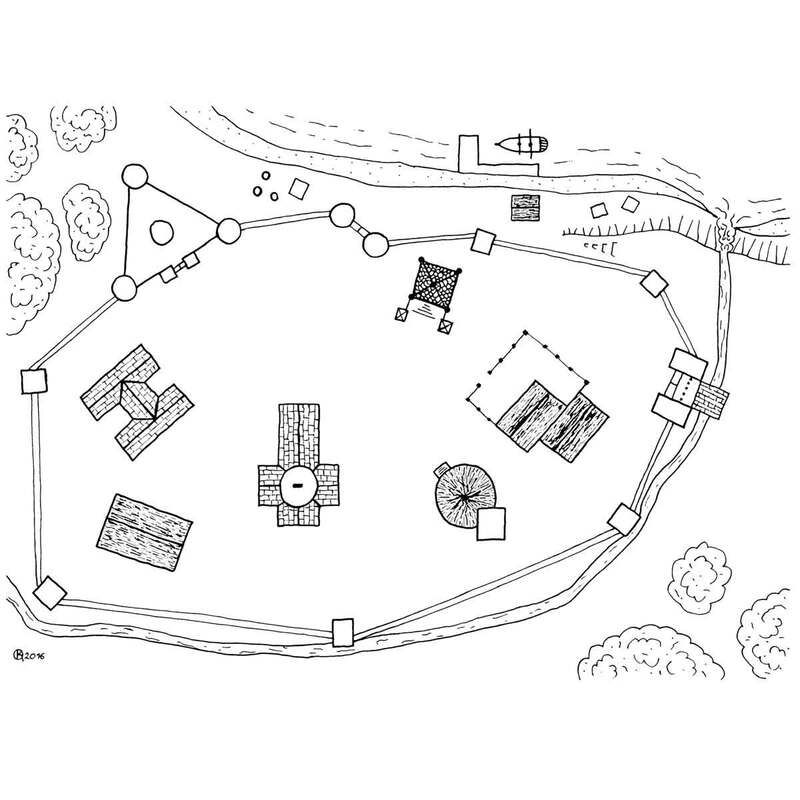 An inn, to the south of the barracks, for the passing pilgrims who can easily accommodate more than a hundred souls. A round cottage with its wooden tower, where the hunters train. A stable and a forge, joined to one another. A mausoleum with its crypt closing of holy secrets. A triangular fort dominating the whole to the north-west. The church is located in the center of the bastion, at an equal distance from the other buildings, because grooms, soldiers or a blacksmiths, are all equal to Illius’ eyes. The church is oriented due south, because the sun is one of the physical representations of Illius. It is here that the high prelate organizes his congregation and structures the worship around the daily midday mass, but also the three prayers (sunrise, zenith, sunset). 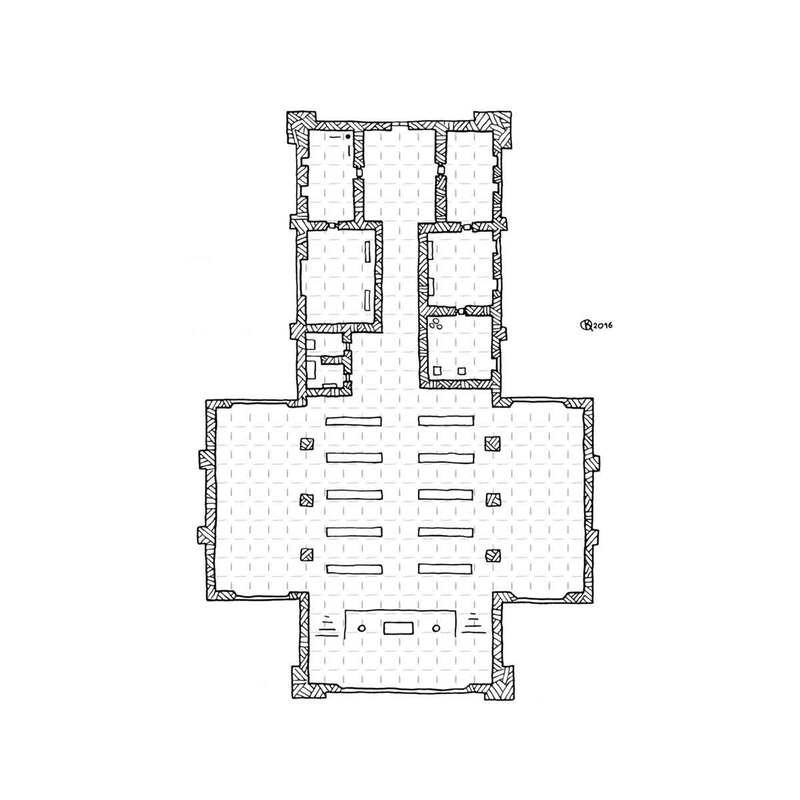 Apart from the Nave and the Transept, which form the bulk of the building, the church has several adjoining rooms: a confessional, a library containing the works necessary for daily worship and the instruction of priests, the baptistery where the new Believers are converted, the sacristy where the sacred objects of daily worship are stored, as well as the two chapels annexed to the right and left of the Nave. The cottage, on the other hand, shelters the watchmen, the group of scouts and elite rangers of the outpost. Also worshiping Illius, their faith is more pragmatic and less spiritual than their other brethren. Known to haunt the neighboring woods, woe to anyone who dares to attack a pilgrim. When they do not hunt, they find themselves here in the gite to cut up their catch. The lodge is made of wood, shaped and carved according to ancient traditions and adorned with sacred solar runes. In addition to the storage rooms for equipment, food and game, the lodge has a large central room for patrolling, a leather-making workshop, and the production of arrows. 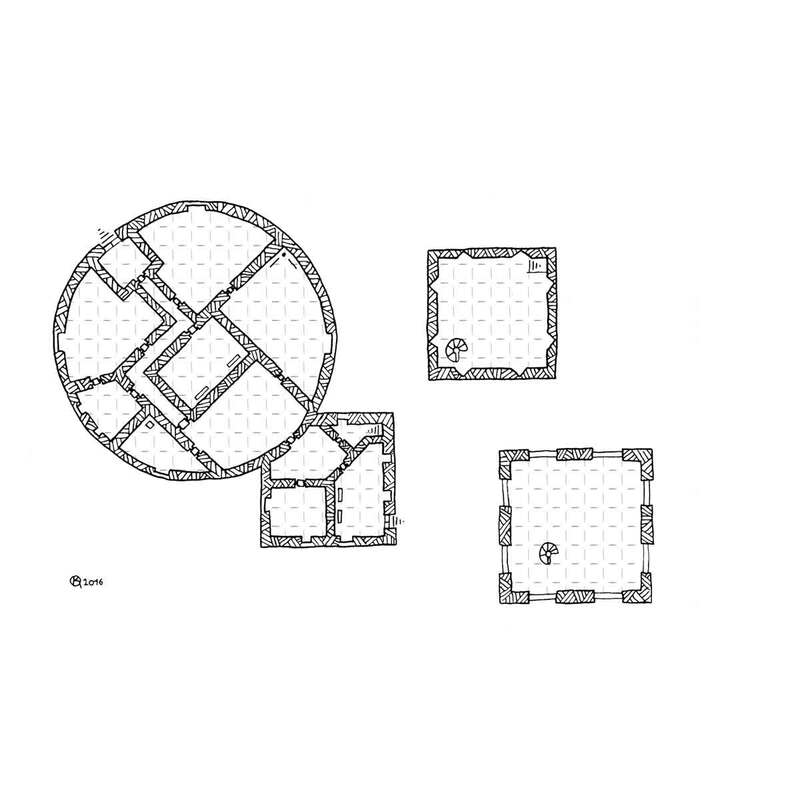 Common room, heated by a large hearth and dormitories where the watchmen can rest between two rounds. A tower is placed next to the cottage, allowing them to get closer to the sun and giving them an overview of the outpost and its immediate surroundings. The gite is also surrounded by numerous training targets where the watchmen perfect their mortal art most of the time. Excellent travail. Cela correspond tout à fait à ce que j’attendais. J’adore ! Merci. Je suis bien content que cela te plaise.